Prepare to be amazed with this easy chicken recipe with orzo pasta! Who doesn’t love a nicely cooked Greek giouvetsi! But the truth is it takes a couple of hours to prepare and no one likes to wait when hungry! Have you ever imagined that you can have a giouvetsi in less than 30 minutes? Now with this delicious variation to the traditional Greek Giouvetsi recipe, you can! We have substituted Beef with Chicken as its quicker to cook and a tiny bit healthier and better for your waistline. In this chicken giouvetsi recipe we will not be using the traditional oven baked method, rather we are cooking this dish in a pan – its so much faster this way and there is little compromise to its flavors. If you wish, you can always finish it off in the oven to get that nice crust on the top 🙂 Give this easy chicken and orzo pasta recipe a try and remember to leave your feedback in the comments section below! To prepare this super easy chicken with orzo, heat a large frying pan over medium heat, pour in 2 tbsps olive oil and sauté the onions, until softened. Season the chicken pieces with salt and pepper and add in the pan; fry the chicken breasts until lightly colored. Remove the chicken pieces and the onions on a plate. In the same pan, add 2 tbsps olive oil and sauté the orzo pasta. Add the tomato paste and continue sautéing. Pour in the tinned tomatoes, the tomato juice and a cup of warm water. Return the chicken pieces and onions in the pan, add a pinch of sugar, a pinch of cinnamon and season well with salt and pepper. Turn the heat down to medium, place the lid on and cook for about 15 minutes, stirring occasionally, until the orzo pasta is cooked. (Halfway through cooking time, check out if all of the liquid has been absorbed and add 1 cup of hot water into the pan). Remove the pan from the stove, drizzle with olive oil and stir in the crumbled feta cheese. 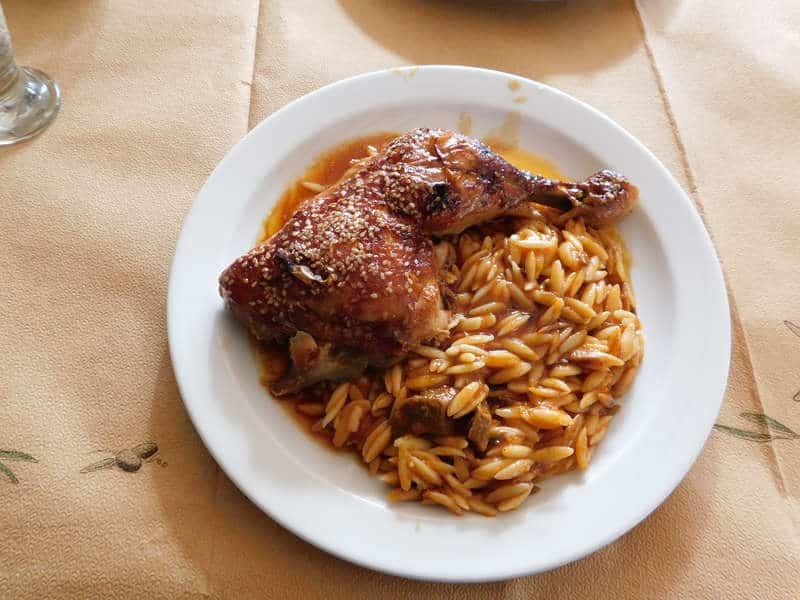 Let the chicken with orzo rest for 5 minutes and serve while still warm. Enjoy! Really quick to make and so tasty, will be making it again thats for sure. The tin of tomatoes? How much is that by volume? Chopped tomatoes? This looks wonderful! Will leaving out the feta cheese ruin the dish? I’m lactose intolerant. What is 1 1/2 cups of orzo in grammes.The packet I have is 500g.Cups always confuses me.